Breathe in and breathe out. It is what we do all day long without a single thought. The brain has made this an automated process, yet there is a certain power behind learning to breathe consciously. We can slow down our heart rates, let our breathe lead us into a meditative state, and even help relieve health ailments including high blood pressure, headaches, anxiety, and stress. However, sometimes it can be exceptionally difficult to learn how to consciously breathe, either while laying down in silence, or while moving throughout your day. Exercise programs like yoga and pilates have conscious breathing as a focal point of each movement. You learn to use your breathe to strengthen your muscles and relax into stretches. If we may so say, a great start to practicing conscious breathing! What are some of the key points? Learn to breathe deeply. Many of us breathe just with the tops of our lungs. Try breathing deep into the belly and back, like you are trying to stretch out your torso in both directions. Breathe in and out, deeply and slowly. When you do physical work, exhale when the muscles are required to do work. This will help guide you through the tension. Relax when you are done with physical work. Take slow, deep, and easy breathes when you relax. Try letting your breathe guide you into sleep. Winding down like this at the end of the day can help to improve sleeping patterns. With so many pilates and yoga places available in this city, find somewhere that suits you and go often! The more you practice, the more natural it will become to breathe consciously. 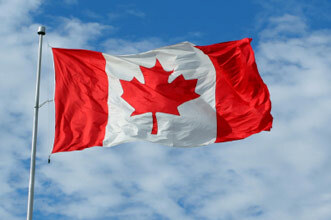 Happy Canada Everyone!! Enjoy the sunshine, the good eats, and hopefully the fireworks! 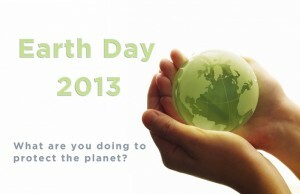 Earth Day 2013- what will you be doing? So this upcoming Monday is Earth Day 2013. Woo hoo! Nothing like a whole day devoted to bringing awareness and love to the planet we call home. Check out a garden, aquarium or zoo. Have a look at the unbelievably beautiful things that have grown on this planet. Remember though that some of these animals and plants may be in danger or threatened of becoming extinct. Take a moment to enjoy their beauty and think about how you can encourage protecting them. Plant something! Start a garden, plant a tree, help a friend plant something. Help bring green and colour to your neighbourhood that is not only good for the eyes and mouth, but also the lungs as plants help filter the air. Not to mention, flowering plants attract bees, which are SUPER important for helping plants pollinate and survive. Help attract bees to your neighbourhood for prettier flowers and happier bee hives. Look into composting. Many of us have so much food waste that ends up in a landfill. Instead of taking up that space, look into where you can drop off your food waste for composting. The food scraps will in turn be used to help grow things. Eat local for the week. Now that it is Spring time, the farms of the greater Vancouver area will be providing more delicious goods that don’t have to travel as far. Dedicate next week to supporting local farmers while reducing your carbon footprint. Another way of doing this is taking a week to say no to things that we love that come from afar such as chocolate, coffee, tropical fruit, etc. This may seem annoying, but giving the planet a brief break is better than nothing! Turn off ALL of your electronics for 1 hour. Also commonly known as Earth hour, turn off everything you own that generates a carbon footprint. Your computers, microwave, idle television, cell phone chargers, EVERYTHING. Take the hour to go out and enjoy a lovely park or just sit at home and chat. This is a really good way to remember that 1) we don’t need these things on all the time, 2) how dependent we can be on these devices, and 3) what it feels like to be free from the ongoing hum of electronics. Bike to work! Give the air a break from your car or the bus and bike to work. It is good for you and the environment. Any other ideas out there? We would love to hear your thoughts. Click here to read a fabulous article about one of our partners, Integrative Healing Arts, and the work they do with Ballet British Columbia. The team at Integrative Healing does an amazing job treating dancers (and others!) holistically using naturopathic medicine, chiropractic medicine, acupuncture, and massage therapy. Stephanie’s love of movement began early in life with dance. It was in her contemporary dance training at Les Ateliers de Danse Moderne de Montreal that she was first exposed to the Pilates’ method. Through her personal Pilates practice she realized the profound benefits of the work as her own body transitioned out of chronic pain. From there, Pilates became an integral part of her personal well being. As a teacher, Stephanie seeks to be a guide in helping her clients find a new awareness of the body through alignment, and a deepened understanding of their own physicality both in and out of the studio. Stephanie is continually looking for new inspiration as an instructor. 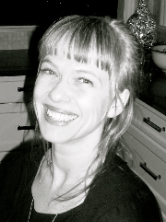 She enjoys a rich practice of her own in Pilates, dance, yoga, and workshops in various movement modalities to further her along in her journey as an instructor. We are excited to announce that we’ll soon be offering Prenatal Pilates with Stephanie. Pilates is good for you ALL the time, but it’s especially beneficial during pregnancy because it strengthens abdominal, back, and pelvic floor muscles. Having a strong core supports a more comfortable pregnancy and delivery, and helps prevent injury. The Pilates method is ideal for exercise during pregnancy because it’s adaptable – exercises can be modified as your body changes so that you’re always getting what you need out of your session. Interested? Contact us by phone or email for more information. Here’s what a participant had to say about Karen’s Worksafe BC program. cleared up a lot of the clouds in my proprioperception of my shoulders. Instructors at The Movement Studio are constantly absorbing new methods and theories to help improve their teaching; to engage with different strategies that will enhance the Pilates experience for their students. This coming August, three of our instructors, Karen, Danielle and Steph, will be participating in an exciting workshop in Seattle. All three of these fantastic teachers come from a dance background and have been involved with movement their entire lives. The skin, the body’s largest organ, naturally absorbs toxins in the air, lotions, deodorants and chemical fragrances that we lather on. The skin also absorbs chemicals from the clothes we wear, especially when we sweat while exercising or doing Pilates. There are several new clothing companies like Prancing Leopard and Vancouver’s own Skyler clothing that are coming out with lines of work-out clothes made exclusively from organic cotton. These products go a long way in helping everyone — from the farmers who are working with the crops, to helping keep watersheds and groundwater clean to taking care of our own bodies. The Movement Studio encourages people to subscribe to as healthy a lifetyle as possible, whatever that includes. It’s important to remember that being healthy differs from person to person — Pilates is a great way to help keep the body toned and supple while helping with mental focus and clarity. Give us a call at 604.732.9055 to book an assessment to make Pilates a part of your routine.